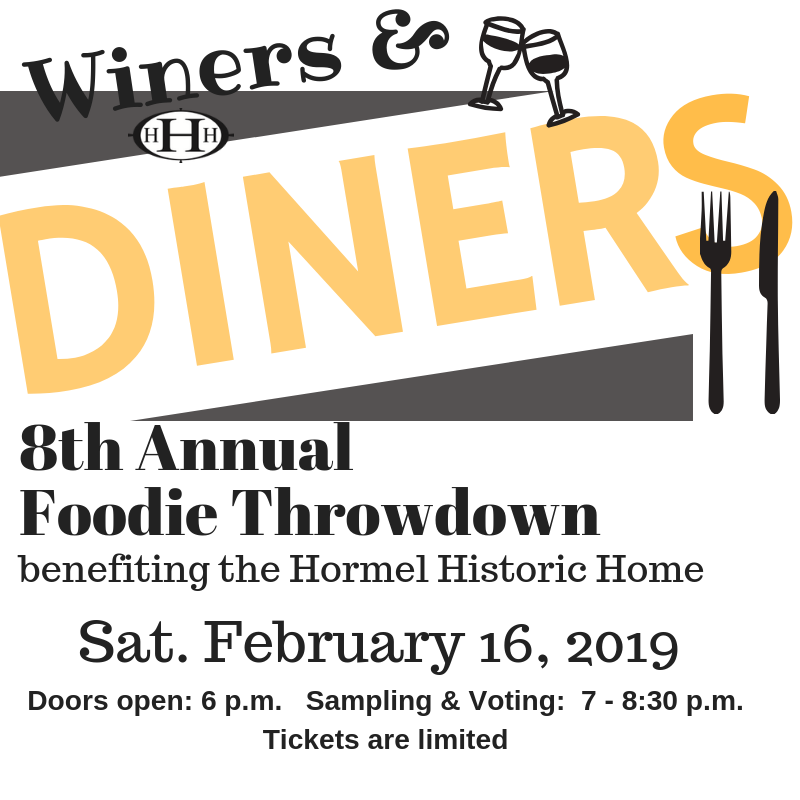 The 8th Annual Foodie Throwdown was a SOLD OUT event and we are grateful to all who showed support to the Hormel Historic Home by attending or cooking or volunteering. 5 Chef teams will competed for votes and the results were very close. The Exclusive Appetizer Contest featured Chefs Wade Kolander and Gareth Hataye. Their dishes tied for people's choice. Wade presented Bacon Wrapped Jalepenos and Gareth served Asian Pork Belly Buns. Yum! In the Main Event Kristine Wolner, representing Mayo Clinic Health Systems Austin/Albert Lea, captured the vote for her Bacon Wrapped Scallop and her Sangria Sorbet. Congrats!! -Leah Erickson & Kim Schulte served Meatloaf with Smoked Mac N Cheese and Carrot Cake. -Anthony Panichelli created Sichuan Pork Dumplings with Pork Belly and Black Sesame Ice Cream Sandwiches. -Missy Toupin & Varinh Van Vugt made a tradtional Hot Roast Beef Sandwich with Mashed Potatoes and Cream cheese filled Phyllo Cups. -Wade Kolander excelled with his Classic Grilled Chicken and Bacon Sandwich and Bailey's Irish Cream Cheesecake. THANKS to everyone who supported the annual fundraiser for the Hormel Historic Home through attending or donating toward the event. It was another great and delicious success. The SPAMagic Duo Terri Bergstrom with Shelly Hovland, Father & Daughter Team Neal & Berghyn Hull, Hy-Vee's Chef Kristine, Hoot and Ole's Jeremy Olson with Kathi Finley of Just Take the Cake, the Just Neighbors Team of Leah Erickson and Kim Schulte and the Wicked Kitchen featuring Wade Kolander.